That was my only request for this weekends “Get your knickers off” meal by G. If you haven’t heard where the GYKO came from, have a look over here. We’d celebrated a little too well at the Australian and New Zealand ball on Thursday night. Friday we were out again at a 50th birthday party which involved a 1.00am finish and a few glasses of champagne. Consequently, I woke up on Saturday morning feeling like I needed to be kind to my body. It needed lots of water and vegetables. G originally began with something from Gourmet traveler, but it involved lamb being dusted in flour, and there were anchovies with broccoli. I wasn’t sure if it was GYKO material. And then he found this! 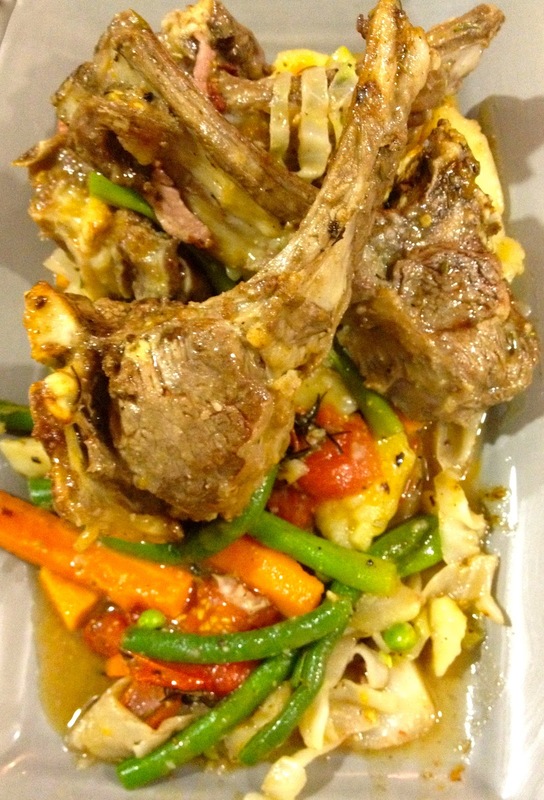 Jamie’s Spring Lamb Vegetable Platter, mint sauce and chianti gravy. It’s from Jamie’s 30 minute meals (if you have a sous chef) I added the bracket to the title myself. The flavours in this meal are amazing. It was exactly what I needed. We invited a couple of friends over and they agreed. I haven’t asked my girlfriend if she got her knickers off, her husband didn’t cook the meal, but he was definitely giving it his best shot when they left our house. I’ll put all of the ingredients below with a link to the recipe. The process was stunning to watch. The house smelt fabulous. 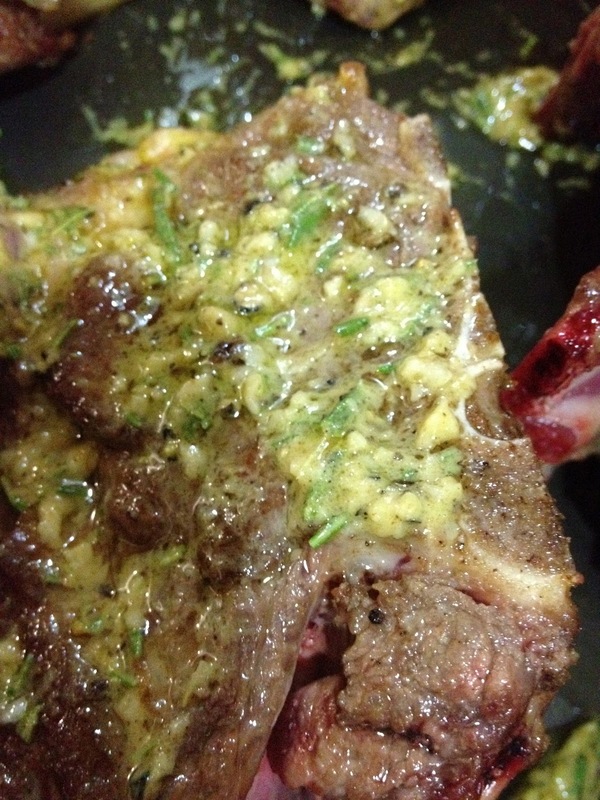 After the lamb had been seared in the frying pan it was coated with rosemary, garlic, dijon mustard and white wine vinegar. 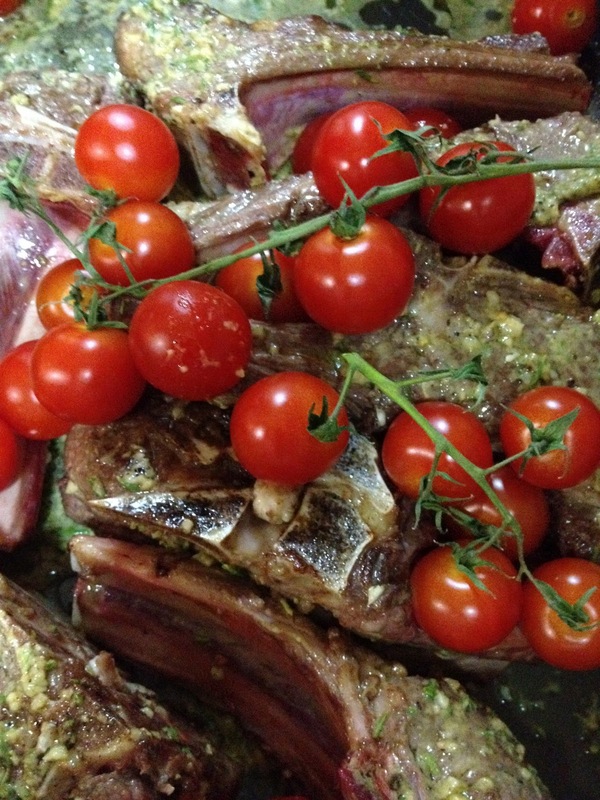 The tomatoes were then placed on top of the lamb in the roasting tray and baked. Those tomatoes were delicious. DELICIOUS! The vegetables stole the show. They were done in a chicken stock and there was a hint of lemon and mint. They were added to pan at the end. Here’s how it came to the table. Once again, my photography has let us down, but this meal is a winner. G thought maybe the lamb was a bit chewy so maybe that’s one thing to watch out for. The mint sauce that came with it was perfect. It was definitely GYKO worthy.